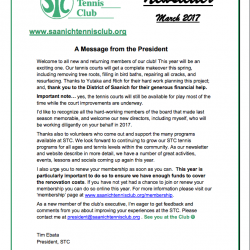 STC Newsletter – a 2017 Preview! With brand new courts coming our way, we’re excited for the activities and events to commence for our 2017 outdoor season! Our website updates will be up shortly, but for now, please have a read through our newsletter for important information about our club! ‹ Court repairs are well underway!! !